A 47-year-old Washington Township man has been arrested on 3 counts of bank robbery in both Oakland and Macomb Counties. Michael Hue Thompson is accused in the March 7, 2019 attempted robbery of a Chase Bank in Chesterfield Township, the March 8 robbery of a Huntington Bank in Shelby Township and the March 21 robbery of the Bank of America in Orion Township. He has been charged with three counts of bank robbery in US District Court for the Eastern District of Michigan. 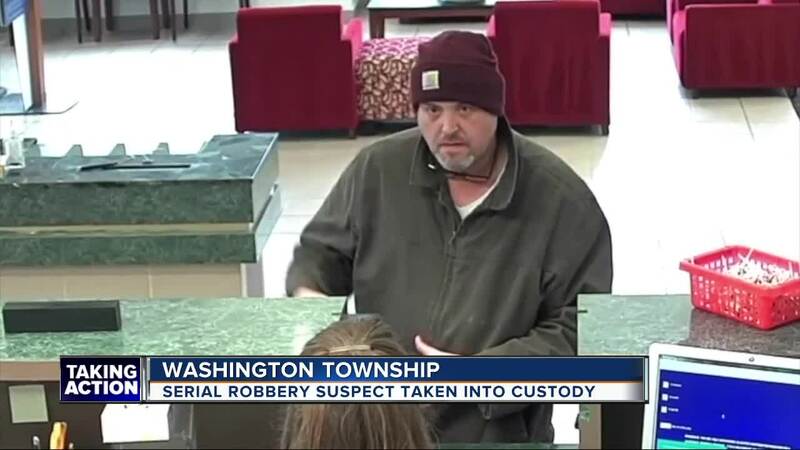 (WXYZ) — A 47-year-old Washington Township man has been arrested on 3 counts of bank robbery in both Oakland and Macomb Counties. Michael Hue Thompson is accused in the March 7, 2019 attempted robbery of a Chase Bank in Chesterfield Township, the March 8 robbery of a Huntington Bank in Shelby Township and the March 21 robbery of the Bank of America in Orion Township. He has been charged with three counts of bank robbery in US District Court for the Eastern District of Michigan. According to federal documents, Thompson was identified based on anonymous tips following news reports. Thompson has a criminal history in Indiana, with two convictions for theft/receiving stolen property in 1997 and 2003 and a 1999 conviction for bank robbery.